I took this image of Jupiter close to Mercury over the Forest tonight, just after sunset. Jupiter is the brighter planet at the top, Mercury is the red planet at the lower right. Noel Carboni (Florida, U.S.A.) did some clean up processing on this one before sending back to me – so this image has already been once around the planet 🙂 Canon 5D with 100-400mm zoom and x1.4 converter, ISO 400, 3-seconds, f#18. I think that Jupiter and Mercury will be at their closest in 3-days time. 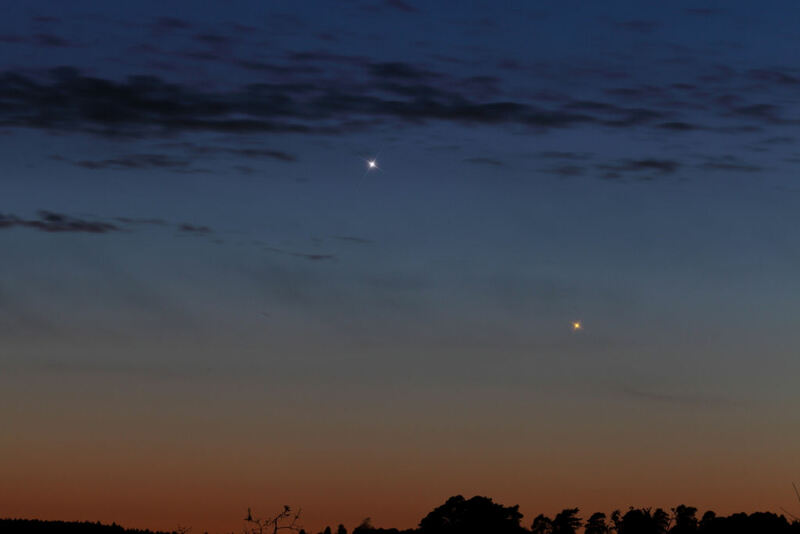 If you do want to see them – DO NOT – scan across the West with telescopes or binoculars until the Sun has FULLY set!!! !